Dogashima (堂ヶ島) is located on the west side of Izu Peninsula, Shizuoka. West side of Izu Peninsula has many beaches with Onsen and fresh fish. Dogashima has very unique beach side. There are many cliff and small islands which have beautiful national tunnel. Also, at low tight, you can walk to the Sanshiro Islands. In summer, many people visit here and enjoy beach, onsen, fresh fish and cruse at the islands. There are many public parking. Public onsen cost 500 yen. There is exclusive cruse tour to travel islands of Dogashima. You can enjoy great islands and their cliffs, tunnels and more. 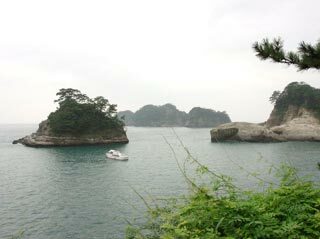 The landscape of Dogashima is also known as Matsushima of Izu Peninsula. The harmony of sea, mountain, islands, and beach create the national rhythm and relaxation moment. Also, Dogashima has the beautiful scene of Sunset.